It wasn’t love at first sight for Marcus, the owner of Koufu Trendy Chinese Cuisine. It grew on him and the more he ate, the more he fell for it. A recipe homemade by his mother-in-law, he now swears by it to be his favorite! Roping in his wife and his mother-in-law, Koufu Trendy Chinese Cuisine was born. Koufu is a moniker coined by Marcus but its Chinese meaning is actually ‘Yau Hau Fook’. It means one has good fortune to feast on great food. The owner believes in having every dishes served in Koufu to be as authentic as he can get it to be. Hence, he makes the effort to bring in almost all his ingredients directly from Sitiawan. Mother-in-law makes all the Foo Chow’s traditional red wine herself while father-in-law is a supplier for noodles in Sitiawan. The mee suah is also from a famous Sitiawan supplier while the chicken is brought in from the small farms to supply kampong chicken for his dishes. That’s not all… even the famous Kong Piang served is from Sitiawan! I am no expert in Foo Chow cuisine but I have had red wine chicken before a few times. I was told by Marcus that the process to make red wine or Uang Chew is unpredictable. If it is a good fermentation, the red wine will have a good balance of sweetness with a tinge of sour whereas a bad one will be almost just sour. Red wine is made from fermentation of glutinous rice, red yeast and Jiu Bing (wine biscuit). If you are interested in how it is made, check out here. 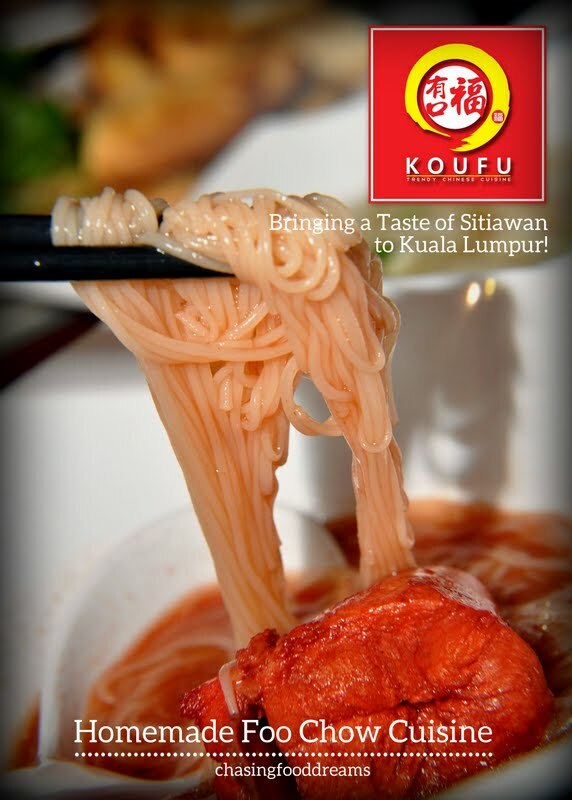 Koufu serves two versions of their signature Red Wine Noodle Soup, one less potent with regular village chicken (RM10.90) and one with a stronger dosage of red wine and kampong chicken (RM16.90). It is to cater to all as some prefer a milder taste of the red wine. Literally, the whole bowl of ingredients is from Sitiawan. From its fine smooth and velvety mee suah to the homemade red wine and kampong chicken, the premium version is flavorful and comforting. As I am fairly fond of all types of homemade wine, I took an immediate liking to this one. It has a great balance of flavors, subtle sweetness with just a nice tinge of sourness. The thickness of the red wine is pretty good as one can see how its coats the mee suah nicely. Chicken pieces are firm and there were also some pieces of ginger. In addition, the mee suah also did not turn soggy even after a good soaking. Did I mention the portion was good too? It’s great value for a bowl of homemade comfort goodness for RM16.90! Bouncy noodles nicely seasoned with sweet soy sauce were aromatic. Crowning the noodles are sliced fried lean meat and crispy bean curd sticks with some greens. It also comes with a bowl of piping hot wantan in soup. It’s simple but has great textures and simple flavors. For RM8.90, it’s a decent dish for simple pleasures. My favorite of all the noodles I tried that night! Long Yen noodle is an authentic Foo Chow noodles made with basic tapioca starch, flour and egg. It is cooked on a pan to resemble a pancake and then sliced up and cut into noodles. Here it is cooked in a soul warming broth filled with a soothing light starchy broth with prawns, fish cake, mushrooms, black wood fungus and greens for RM8.90. The slippery noodles are just so good with a soft chewy texture and the overall flavors are just so heartwarming like it came from a mother’s kitchen. It’s my first time tasting this and I am thoroughly sold on the noodles. Simply a must for me! This one is very unique. Either you’ll like it or not at all. I am told it’s quite popular in the Foo Chow community. It’s Lu Mian or braised noodles mixed with mackerel infused laksa broth for RM7.90. First taste for me had a fishy aroma coupled with bamboo shoot flavor. I can’t quite make out the exact flavors for this one because it is really unique. There is also squid and black wood fungus in it. The noodles are al dente and pretty good so I have made up my mind to order their Lu Mian alone without the laksa the next round. 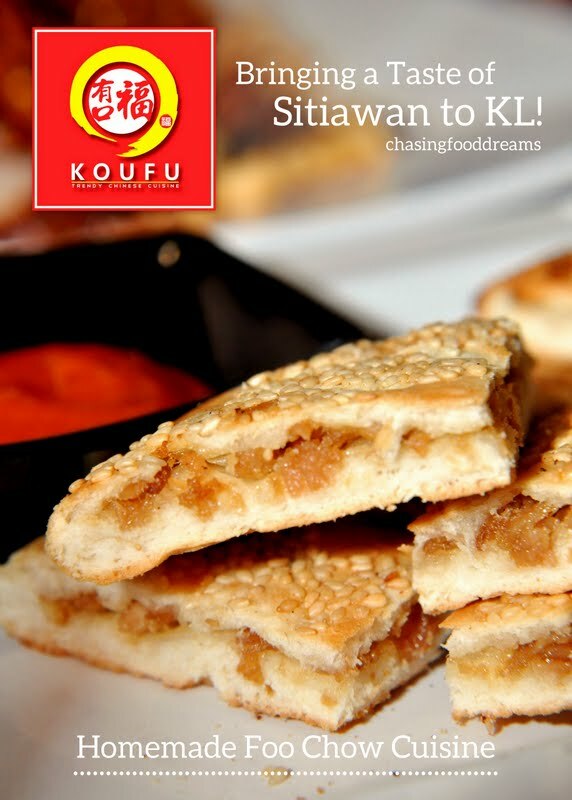 Give this a try if you are feeling adventurous… who knows, you might like it since I am told many Foo Chow diners enjoyed this here at Koufu! This one is also a popular one with all of us for RM7.90. The meat is tender and very flavorful from the marinade. I can taste the red fermented wine flavor in this meat and it is also well fried to produce a crisp skin and tender juicy inside. The side of chili sauce is not too bad. It was so good, we had to have another order. A famous biscuit that symbolize the Foo Chow bakery, this pastry is made from flour, lard, onion and salt. It has a filling of fragrant onion mixture and some even has meat. Leaving it to the pro, Koufu gets his supply from a very famous Kong Piang maker in Sitiawan. The Kong Piang is priced at RM3.50 for small portion and RM6.90 for a large one. The Kong Piang is very toasty when served and it has a side of garlic chili sauce. The doughy pastry is studded with loads of toasty sesame seeds and very fragrant of onions. A first for me and I do admit to liking it. Let’s hope I get to visit the baker in Sitiawan! I am familiar with this dessert as it resembles the northern Leng Chi Kang Tong Shui for me. At Koufu, it is overloaded with 10 ingredients ranging from longan, black jelly, jellies, pearls, sweet potatoes, barley, sea agar agar and crunchy basil seeds. Priced at RM4.90 for small and RM5.90 for large, it is a bowl of nice sweet ending with lots of textures! We enjoyed some beverages like Honey Lemon, Carrot Juice and Iced Barley. Koufu also serves up hot flower teas and one of us had Beauty Tea, a sachet filled with French Rose, Jasmine Flower & Apple Flower for whitening and improvement of skin. Hats off to Koufu in trying very hard to be as authentic as they can! It shows that every little bit counts and we can definitely taste it. As all the main ingredients are made by the owner’s mother-in-law herself, we are assured of quality dishes with homemade flavors. Though the location of this restaurant is not as strategic yet as it is a new area, I doubt this will stop foodies from sniffling this place out for a taste of Foo Chow cuisine from Sitiawan! The kong piang is definitely different from our Sibu Foochow kompia. Sure would love to try their Foochow delights, that's for sure. Everything is very authentic setiawan indeed...The only authentic setiawan noodle I have had was when I was there. And that is that one time only.. I'm glad they think they're "trendy". Cute signage. Never heard of the la mien with laksa broth even as a foochow. Haha. Probably specific to Sitiawan. The way they cook the chicken soup is also slightly different too.